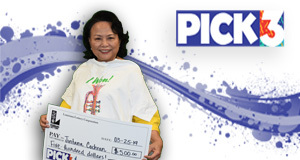 Congratulations to Baton Rouge resident Jintana Cochran on her $500 Pick 3 win! Jintana's friend asked her to purchase a Powerball ticket for him, but only provided her with three numbers to play. Because of this, the Thai native chose to play Pick 3. "It's awesome!" she explained. Jintana purchased the winning ticket at Circle K #8046 on Floynell Dr. She plans to give part of the winnings to her friend, and a portion to the Thai temple, then use whats left to have fun during her upcoming trip to Thailand!